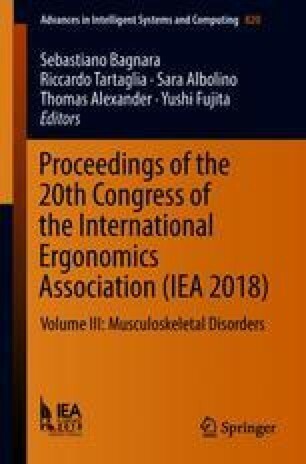 The biomechanical benefits of changing posture from sitting to standing are evident from the research on prevention of musculoskeletal disorders. However, the decision for workers who choose to sit or stand is also related to the cognitive and psychosocial needs in their work area. Research in office areas who have provided sit-to-stand workstations showed that the choice to stand in a team environment where other team members are sitting is often influenced by the team communication requirements. The workers indicated that maintaining eye contact with each other while discussing issues influenced their decision to adopt a standing position as a group and if all members were sitting then the decision to sit rather than stand was the general outcome. Further, where adjustment was available in both the workstation and chair design, the workers made necessary adjustments to maintain similar eye heights rather than to suit their individual anthropometry needs. Their ability to see and hear each other was assessed as more important from a cognitive and psychosocial perspective in these team settings than anthropometry. In individual settings such as focus rooms or enclosed offices where the worker is alone, they were more likely to adjust their workstation based on their physical requirements. If they spend much of their day in meetings where they are sitting, they use the time back at their workstation to stand whilst processing emails. However if they stand and walk a lot in their work, they choose to sit at the workstation as a break. Furthermore, it was found that the activity undertaken by the worker also influenced their decision to sit or stand. For example, when performing activities requiring moderate levels of concentration such as talking on the phone or writing emails, they were more likely to stand than if they were performing a task requiring focused attention such as typing a report. Thus for tasks requiring greater concentration, their preferred working position was sitting, as they were less likely to be distracted by others moving around the office. It is evident that the cognitive and psychosocial demands of the workplace will influence the utilization of sit-to-stand workstations as much or even more than the physical demands.